The Boundless Thicket: Red Wine: the Elixer of Life? 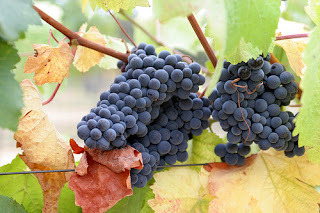 Pinot noir grapes in Saratoga, California. Ever had your doctor prescribe alcohol? I highly doubt it. That being said, I would venture to guess that nearly everyone of legal age has heard that a glass of red wine can be beneficial to your health; in fact, there’s a good chance that you or your parents have even used the adage as defense when uncorking the bottle at night. So, if the health benefits are such universally accepted truths, why are doctors writing prescriptions for an aged bottle of Pinot noir? Now, after years of mindlessly nodding in agreement, I want to see some proof. I set out to find exactly what kind of health benefits red wine provides, if any at all, and by what means? Further, I was curious whether there is evidence that explicitly supports this and if so, is advocating wine consumption now responsible? As an occasional indulgent in red wine, I was happy with my findings. My sudden interest in red wine was not random and, despite what my friends may say, I am by no means an oenophile, but I am currently enrolled in a course titled Human Metabolic Disease and to my surprise (and delight), red wine came up. Specifically, it was explained that red wine contains a compound known as resveratrol, which, in conjunction with the Sirt1 protein, is responsible for a number of activities that bestow onto red wine its healthy reputation. Resveratrol, shown in its cis and trans isomeric forms in the MarvinSketch below, is a compound found naturally in the skin of red grapes--hence its inclusion in red wine. In nature, it is trans-resveratrol that is relevant and it is that isomer that I will be referring to throughout the post. So just to start somewhere, I typed resveratrol into the Google Scholar search engine and the second hit turned out to be the literary equivalent of the Holy Grail on resveratrol. In all honesty, the article, Resveratrol improves health and survival of mice on a high-calorie diet, while being published in Nature did not sound promising at first; I was not interested in how red wine would help mice, but quickly it became apparent that these results were not exclusive to the rodent population. The abstract started by making the claim that resveratrol (3,5,4’-trihydroxystilbene) extends the lifespan of diverse species—a claim I was skeptical about at first—and went on say that resveratrol, in addition to lifespan lengthening, was also involved with increased insulin sensitivity, reduced insulin-like growth factor-1 (IGF-I) levels, increased mitochondrial number, and improved motor function. At this point I was starting to get a grasp on the health benefits conferred by red wine and its health crusader, resveratrol. It comes as no surprise to anyone that obesity is associated with an increased risk of cardiovascular disease and type-II diabetes, however, a better kept secret is that obesity is tightly associated with increased risk for age-related diseases, such as cancer and inflammatory disorders. In the body, the gene SIRT1 was identified as a key regulator of processes such as glucose and insulin production, fat metabolism, and cell survival, leading to speculation that sirtuins, which are a class of proteins that the SIRT genes codes for, may well mediate effects of caloric restriction in mammals. 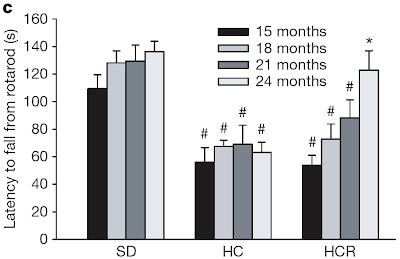 If this was the case and caloric restriction (reducing caloric intake by ~40% below that of ad libitum-fed animals) is the most robust and reproducible way to delay age-related diseases and increase lifespan in mammals, then enhancing the activity of the SIRT1 gene should increase levels of Sirt1 (protein) and increase longevity. Then the question becomes: how do you increase the levels of SIRT1 expression? The answer: resveratrol. The authors revealed that after screening 20,000 molecules, resveratrol was the most efficacious at enhancing SIRT1 activity in vitro (in a test tube). Figure 1 | Resveratrol increases survival. 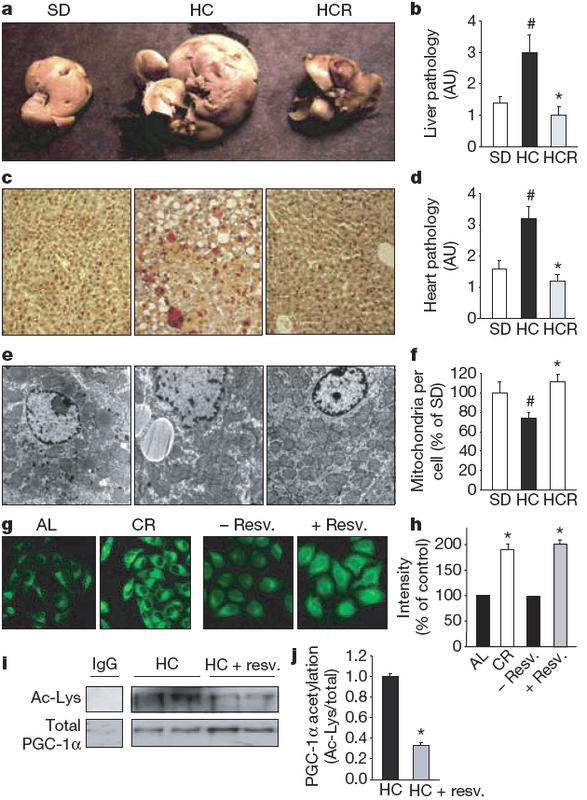 A higher life expectancy was observed in high calorie mice who has been treated with resveratrol (HCR) as compared to those who were not treated with resveratrol (HC). 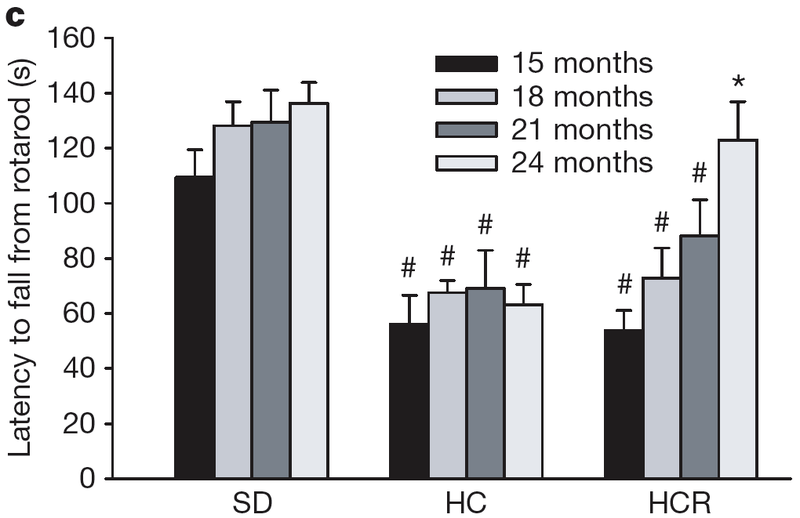 HCR mice had nearly identical survival rates of standard diet mice (SD) after 110 weeks. Figure 2 | Rotarod performance test. Results supportive of the hypothesized increased lifespan by resveratrol are well illustrated by the data above (Figure 1). 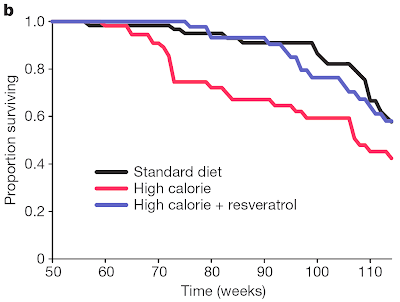 This set of experiments was performed on mice with the only variable components being their calorie intake and increased levels of resveratrol in one group of mice. There was not a significant difference in body temperature, total faecal output or lipid content, or post-mortem body fat distribution, which eliminates any foreseeable confounders. As seen in the graph, the survival curves noticeable diverge around 65 weeks of age. According to the article, at 114 weeks, 58% of the high-calorie control (HC) mice had died, as compared to the 42% of high-calorie with resveratrol supplement (HCR) mice. 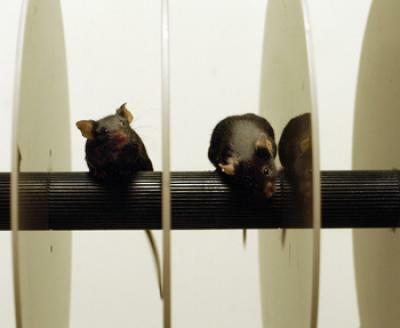 Further, 42% of the standard diet control mice had died (same as the HCR mice). As a follow up to this, it was important for the experimenters to ascertain whether quality of life was maintained. It would be rather inhuman to prolong life if the quality of that extended lifespan was poor. Interestingly, they tested this by measuring balance and coordination via a rotarod test (Figure 2). While the rotarod test was not explicitly explained in the article, a quick check on Wikipedia explained the test this way: “Basically, the [rotarod] test involves a rodent being placed on a horizontally oriented, rotating cylinder (rod) suspended above a cage floor, (not high enough to injure the animal, but high enough to induce avoidance of fall). Rodents naturally try to stay on the rotating cylinder, or rotarod, and avoid falling to the ground. The length of time that a given animal stays on this rotating rod is a measure of their balance, coordination, physical condition, and motor-planning. The speed of the rotarod is mechanically driven, and may either be held constant, or accelerated” . Figure 3 | Resveratrol improves rotarod performance, a measure of balance and life quality. Time to fall from an accelerating rotarod was measured for all survivors for 3 months for the three subsets: standard diet mice (SD), high calorie diet mice (HC), and high calorie diet + resveratrol mice (HCR). From the results above (Figure 3) it is clear, and somewhat astonishing, that the motor function increased as the mice treated with resveratrol aged. In fact, their motor function increased to a point where they were nearly indistinguishable from the standard diet mice. The latency of fall from the rotarod is simply the time the mice was able to stay on the rod. From the same colony of mice, the other claims about resveratrol’s health benefits were tested; the results of those tests are shown below. Fatty liver, a condition directly exacerbated by obesity and high caloric intake, was prevented by the presence of resveratrol. This can be seen clearly in the liver size differences between the HC mice and the HCR mice. Graph (b) shown to the right of the liver morphology pictures is a measure of fat accumulation in the liver as measured by red oil O staining and the graph makes blatantly apparent that the fat accumulation was the lowest in the liver of the mice treated with resveratrol. Visualization (c) and graph (d) are further evidence for the decreased organ pathology conferred by resveratrol. These two depictions show the results from heart analysis; figure (c) shows samples of heart tissue taken from the respective mouse colony and led to the conclusion that in blind scoring of overall tissue pathology, the HCR mice scored the lowest in abundance of fatty lesions, cardiac muscle vacuolization, degeneration and inflammation. Figure 4 | Resveratrol improves liver histology, increases mitochondrial number and decreases acetylation of PGC-1a. 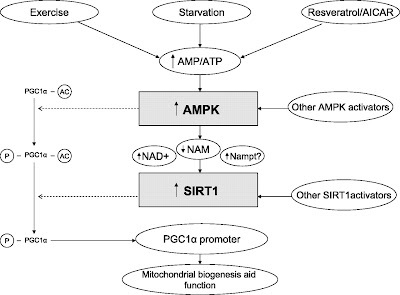 Resveratrol discourages the development of fatty liver, as assessed by liver size (a), improved heart pathology measured in arbitrary units, AU (d), increases mitochondrial per cell number (f), Resveratrol reduces the acetylation of PGC-1a, a known Sirt1 target and regulator of mitochondrial biogenesis, in vivo (i and j). Exercise and reduced caloric intake are known to promote increased numbers of hepatic mitochondria and logically, the researchers were curious as to whether resveratrol could induce this effect as well. It did. As demonstrated by graph (f), the mitochondrial count was significantly higher in HCR mice than HC mice and further, the HCR mice had higher numbers of mitochondria than SD mice. The research team also measured citrate synthase (CS) activities in the mice, as it is a good indicator of mitochondrial activity, and found increased CS activity in the HCR mice compared to the HC mice. While this was written to be a positive effect, I asked myself: how does increasing mitochondrial number increase fitness? 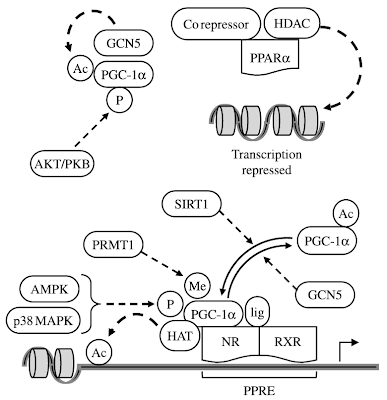 Figure 5 | SIRT1-mediated deacetylation activates PCG-1a, which has been shown to upregulate gene transcription involved with mitochondrial biogenesis. 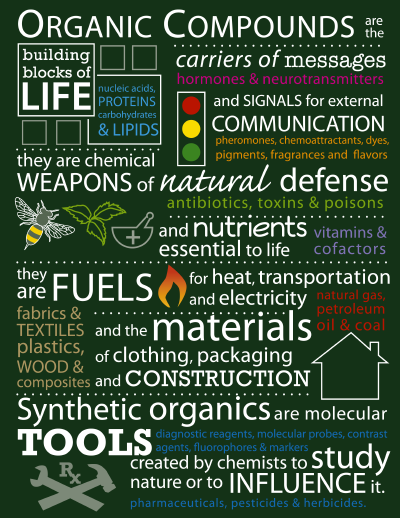 Typically as we age, our number of mitochondria declines and results in a loss of endurance and energy production. Thus increasing the number of mitochondria in the liver as resveratrol has been shown to do has explicit implications that resveratrol could curve the negative effects of aging and help maintain higher levels of energy production as we age. So the next logical question is: how exactly does resveratrol promote mitochondrial biogenesis? The researchers have proposed a mechanism involving the interaction of PGC-1α and resveratrol as a means to do this. PGC-1α, a transcriptional coactivator, has been shown to tightly control mitochondrial biogenesis in the liver and in muscle and PGC-1α activity is positively controlled by a Sirt1-dependent deacetylation (i.e. Sirt1 is a deacetylase enzyme, meaning it post-translationally modifies its target protein by removing a acetyl group). Made the connection yet? Figure 6 | Schematic of resveratrol mediated mitochondrial biogenesis increase. 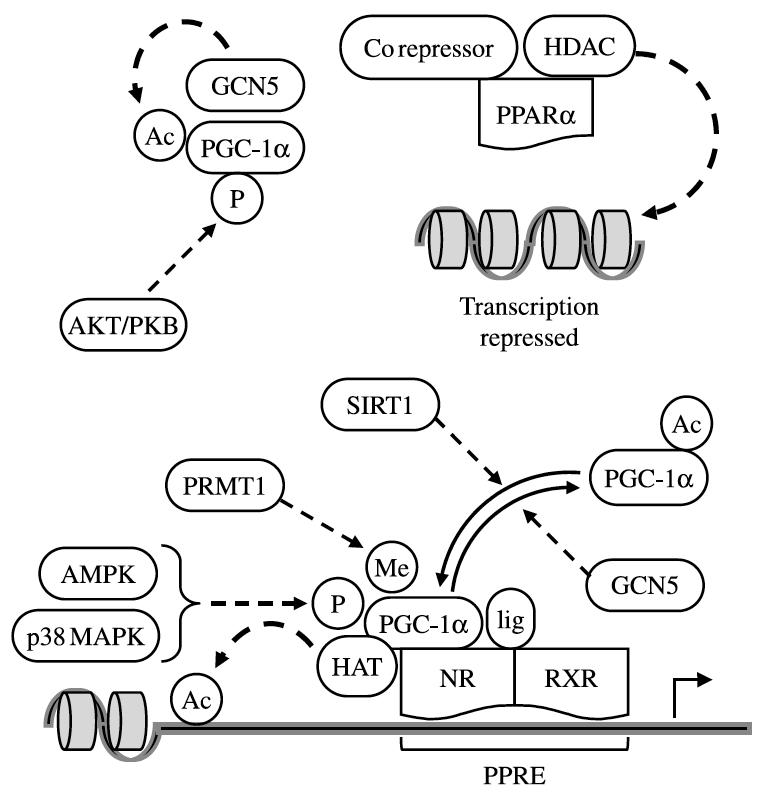 This figure implies that the phosphorylation of PGC-1a by AMPK (AMP-kinase) makes it more susceptible to deacetylation by Sirt1. 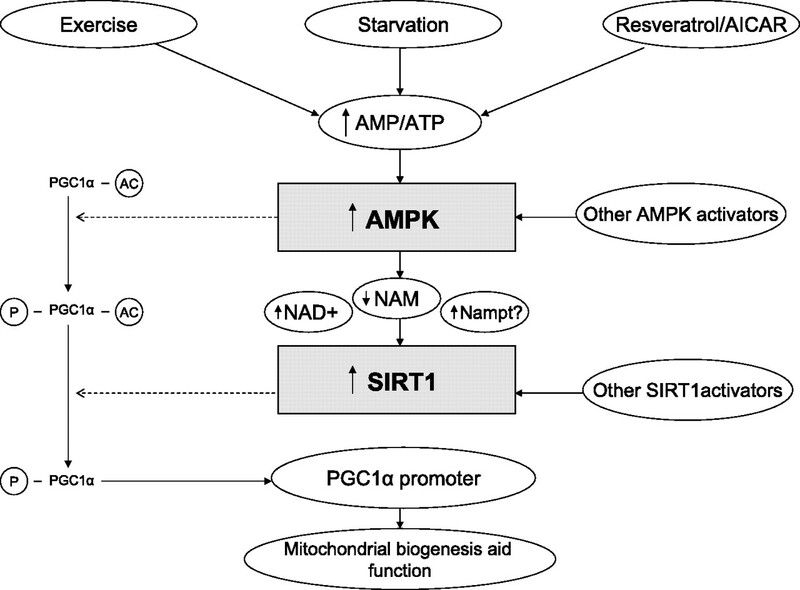 Resveratrol ultimately activates SIRT1, which activates PGC-1a, which leads to increased mitochondrial biogenesis. Below, the JMOL depicts the Sirt1 deacetylase, which is activated by resveratrol. As this research into the connection between resveratrol, PGC-1a, SIRT1 activity, and conferred metabolic health benefits is young, the availability of JMOLs showing this conglomeration was difficult to find. However, this shows Sirt1 and its tertiary structure. It is within its active site that PGC-1a is deacetylated and made capable of promoting mitochondrial biogenesis and function. As discussed earlier, SIRT1 activity is enhanced by resveratrol, so via resveratrol enzymatic enhancement of SIRT1, PGC-1α activity is increased and biogenesis of mitochondria is elevated. Experimentation revealed that the HCR mice showed three times fewer acetylated PGC-1α transcription coactivators, which makes a strong case for the connection between resveratrol and the increased number of mitochondria. To end on a practical note, resveratrol is not present in high enough levels (0.1-14.3mg/L) in red wine for it to be seen as a therapeutic agent or medicinal alternative, and to answer a previously posed question: it is not responsible for physicians to start writing prescriptions for bottles of aged red wine. That being said, red wine in moderation (two 8 ounce glasses for men and one 8 ounce glass for women) on a daily basis is perfectly acceptable and can potentiate gaining some of the benefits outlined above . When it's all said and done it seems safe to say that just as wine gets better with age, people age better with wine. Cheers! I enjoyed your blog post! The title of your post caught my eye because I've also heard that a glass of red wine daily is good for you however time and time again I've heard in health classes that alcohol is very damaging to your liver and metabolism. The power of Resveratrol is unique and I think you did a great job of explaining it in a way that someone without an organic chemistry background would be able to grasp. The graphs you included really aided the text and the studies of mice helped improve the content of your blog. Great job, cheers!